First, should we really have the tips of the toes in line with the outer edge of the thighs, or isn't it so important after all? And second, is it really necessary to have the left leg always above the right leg, or isn't that so important either? This month I would like to start with the first question, and my answer is quite simple: Yes, if possible we should raise our feet so high and close to the trunk that the knees and the base of the spine form an equilateral triangle and the toes are in line with the outside of the thighs. Of course not everyone is flexible enough to put this into practice right from the start. 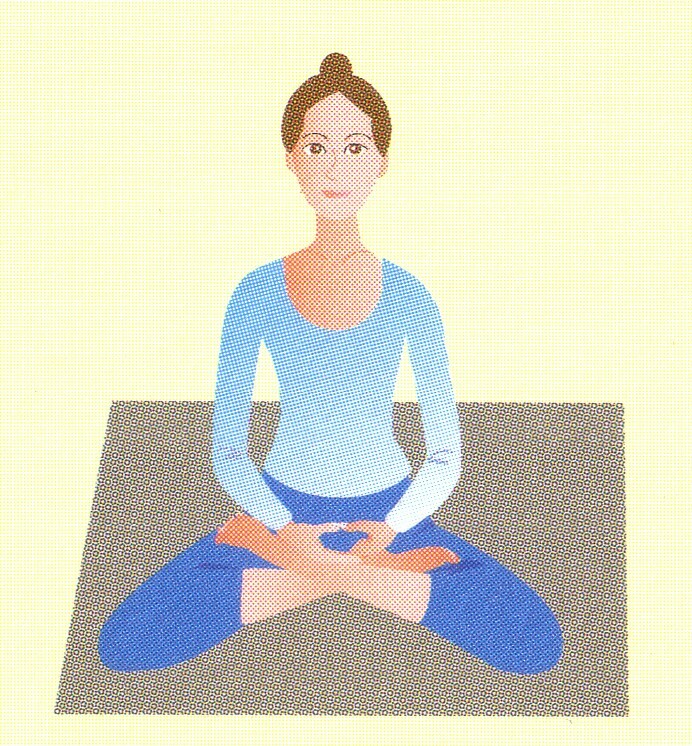 If you can not sit in the full or half lotus position with your toes touching the outer side of the thighs, you simply can't. You will have to experiment with different ways of sitting, and maybe try to get more flexible over time, using strechting excercises etc. But I think that it should be at least our aim to eventually get as close as possible to this way of crossing the legs as we can, because it gives our body the highest grade of stability, and when our body is stable, our minds will become stable too. This answer seems to be nothing less than common sense to me. 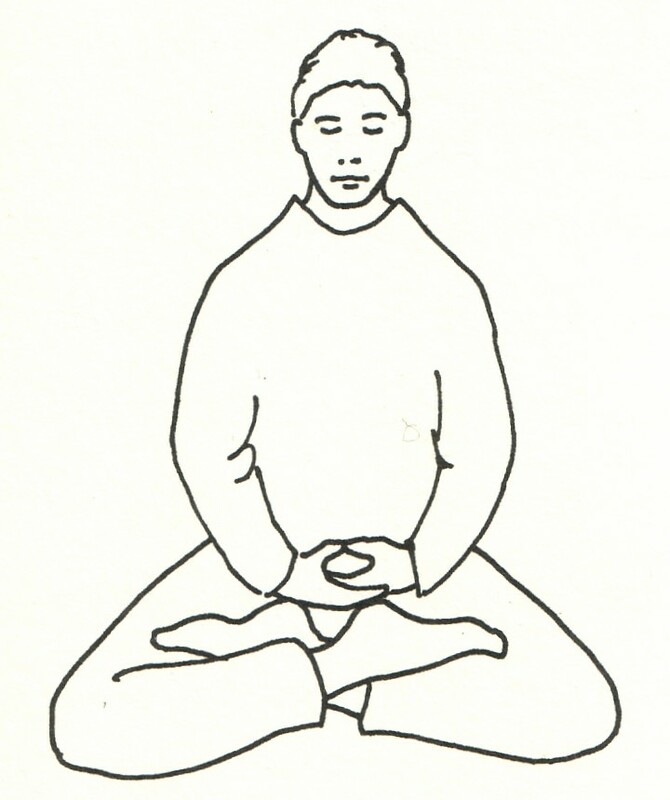 What surprises me though is that it is contradicted by many photographs and illustrations that can be found in books about zazen or on the internet. I would like to take a look at some of them this month. All of the pictures can be enlarged by clicking on them. We already saw the following three illustrations on the left side. 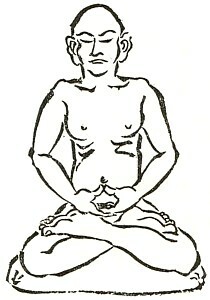 The first one is from Sawaki Roshi's Zendan, probably drawn by the roshi himself. It serves well to illustrate how the toes reach to the outside of the thighs. What is a little confusing about the picture is that the face (or at least the nose) seems to be turned to the right, while the trunk faces straight forward. Also, the tips of the thumbs are pointed upwards, which is usually a sign of too much tension, while the spine is slightly bent to the right, as if the person was about to nod away. 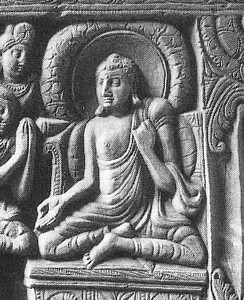 The person on the right - taken from a different text by Sawaki Roshi on zazen - seems to sit just a little bit more straight. 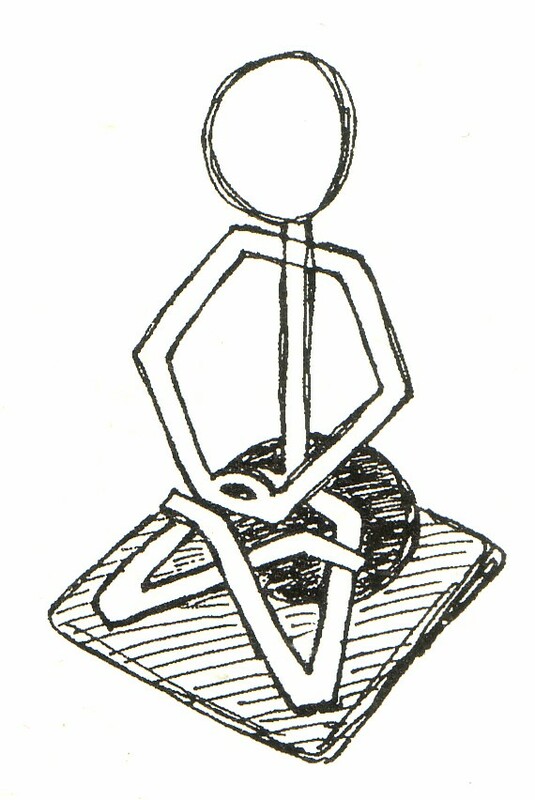 This is Uchiyama Roshi's illustration of a person in zazen. 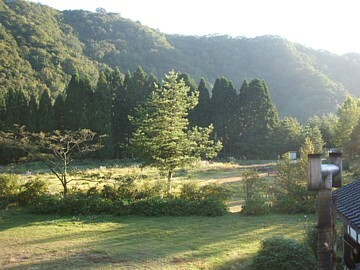 Uchiyama Roshi's logical and analytical approach allows him to strip the person to the bone. Again it is obvious that the feet rest high up on the thighs, the tips of the toes reaching to the outside of the thighs, knees and the base of the spine forming an equilateral triangle. Unfortunately Uchiyama does not use the opportunity to make clear how the pelvis is slightly bend forward. 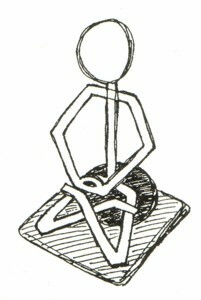 In this illustration, it looks as if the weight of the body rests on only one of the three corners of the triangle (the base of the spine), while in reality it should rest somewhere between that corner and the center of the triangle. Also, with the shoulders connecting to the spine at right angles, they create the impression of a stiff skeleton. Only the head is blown up like a balloon and makes one worry if it won't float off to some higher spritual realm. Quite opposite to Uchiyama's intentions, this person seems to be centered in his head. I do not get an impression of a unity of body and mind from the picture. Maybe because of these problems Uchiyama's picture was replaced by the illustration on the left in the new English edition of "Opening the hand of thought" (2004). But this can hardly be called an improvement: Not only uses the person for no obvious reason the opppsoite way of crossing the legs (in the Japanese original that I have in front of me, Uchiyama only mentions the "orthodox" way of putting the left leg on top of the right, not the other way), but more importantly the feet seem not to be resting on the thighs at all, but are crunched somewhere between the thighs and the lower legs. 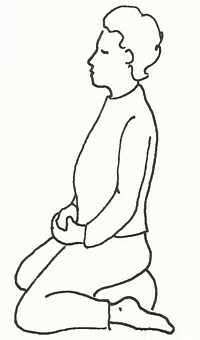 Especially the left leg must hurt if you continue to sit like this for a longer stretch of time. 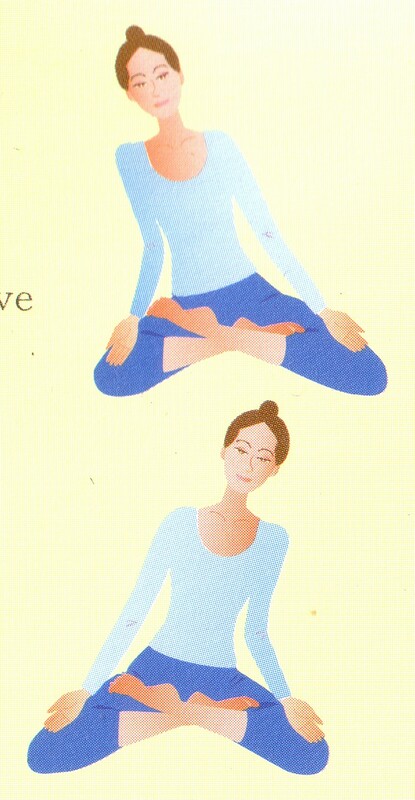 Because the knees are too far seperated from each other, they do not form an equilateral traingle with the spine. 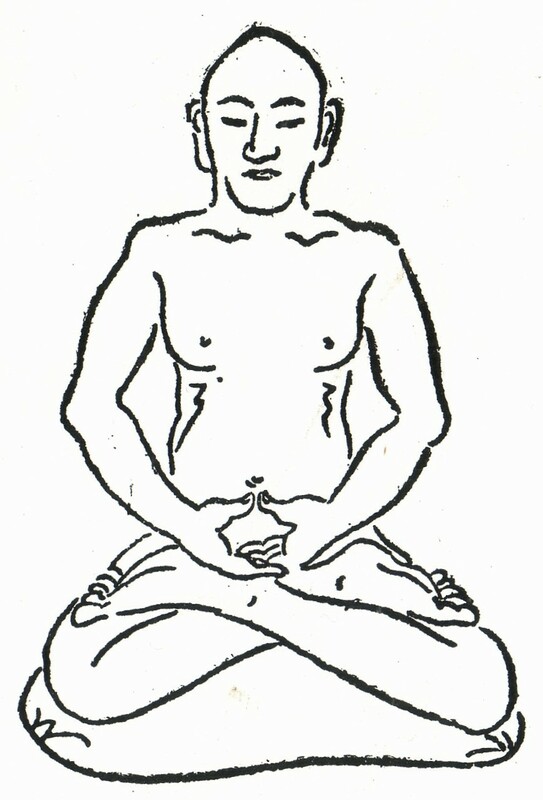 The right knee is protruding forward, and the mudra of the hands bends down on the right side, while the whole upper body is leaning to the left. Even if the illustrators couldn't find a model that can sit in the right posture, they should have tried to fix it when drawing the picture. Instead we find these "kindness" additions that are not in the Japanese original either. 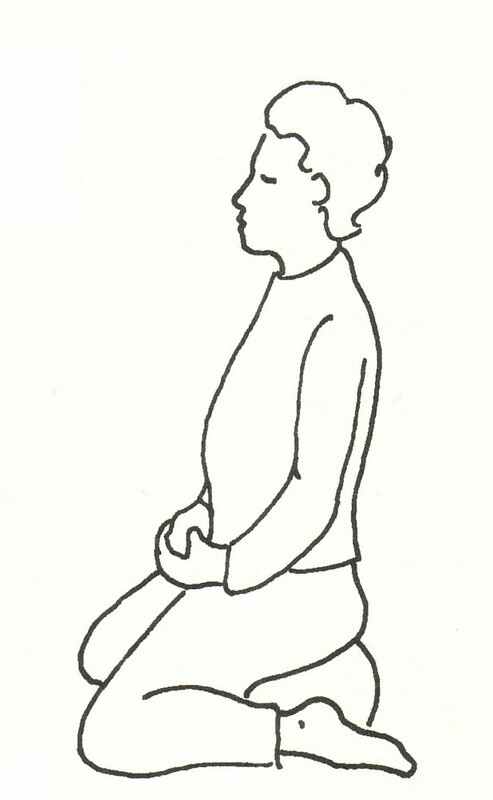 Mentioning the fact that zazen can be practiced in a kneeling position or on a chair is a good thing for those who can not sit in the lotus position, although I don't think that it is a good idea to use the back of the chair to lean against as in the picture on the right. 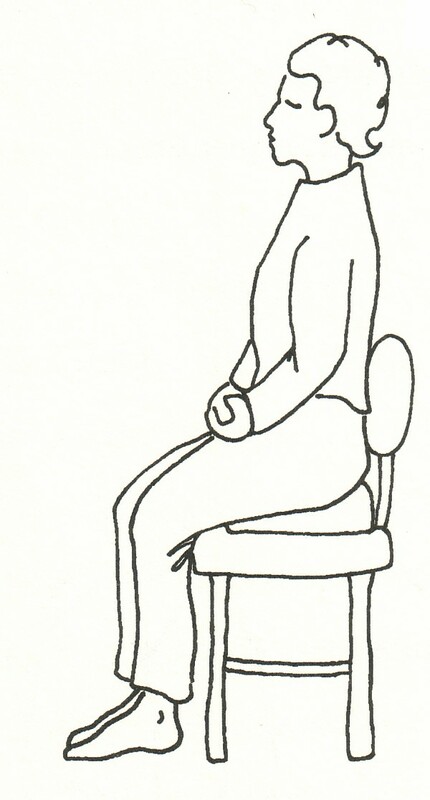 Just as with the zafu (sitting cushion), we shouldn't place our thighs and behind on the whole chair, but try to use only half of it to support the pelvis, while the back half of the chair stays empty. What disturbs me most about these illustrations are the facial expressions. There is no alertness in them at all. The woman on the left and right doesn't have her chin drawn back and seems to be day dreaming. The same is true for the boy above. 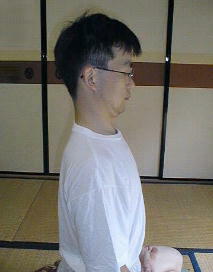 Now I can understand why Sawaki Roshi would shout: "Don't make such a sleepy face - you look like a ball of cotton wool! Pull back the chin and make a lively face." 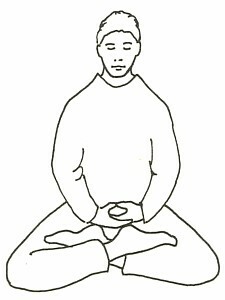 These illustrations come from an offical Soto-shu flyer: "SOTO ZEN - The Practice of Zazen". On the left the girl is staring into space and her right foot reaches only half up her left thigh, thus creating an asymmetry in the legs. 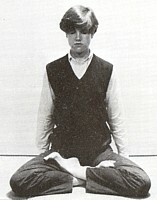 When she is shown swaying from left to right before zazen, her right foot has already slipped most of the way down to the floor and is now crunched between her left thigh and lower leg. If she doesn't switch to half lotus soon, she'll be in big pain! Strange also where her square sitting mat might have disappeared - or is she levitating? 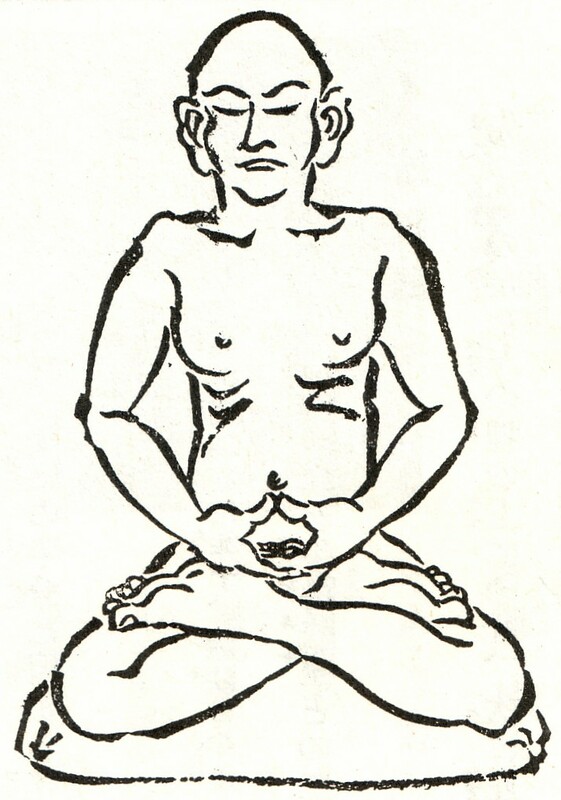 The picture on the right is from the now out-of-print "Shikantaza", the former "official" Soto-shu booklet with introduction to zazen and basic texts like the Fukanzazengi. The text in this book is very reliable and states to "cross your legs firmly so that the tips of your toes and the outer edge of your thighs form one single line... when you cross your legs, your knees and the base of your spine should form an equilateral triangle. These three points support the weight of your body." But the photograph that accompanies the text clearly contradicts it: The left foot is sitting only halfway up on the right thigh, and the right foot is only crunched somehow into the left leg. Maybe this photograph served as the model for the illustration above? It is obvious that the poor girl is in pain. 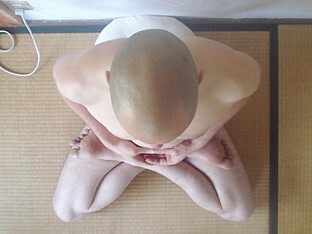 This isn't zazen, this is torture! The photograph on the left is from the new booklet that replaced "Shikantaza" and can also be found online at the official Soto-shu website. 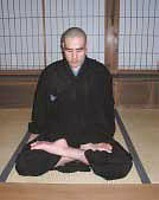 Although most of the photographs in the book are of non-Japanese monks and nuns, they obviously asked a "proper Japanese training monk" to demonstrate the way the legs should be crossed. But alas, the right foot still won't move up the left thigh! In the Japanese part of the same Soto website we do not find the photographs, but the illustration on the right. If you look closely, it becomes clear that it is a copy of the "torture picture" above. 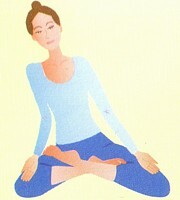 Except that in this illustration the upper body is bend slightly to the right, making it even worse. There is no end to the bad examples. 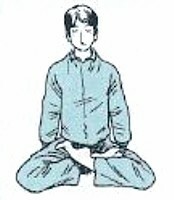 Probably the worst ones are from the website of a layorganization called "Ningen Zen", where an introduction to zazen in Japanese with pictures can be found here. 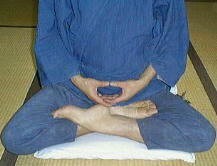 The feet are not resting on the thighs, one knee is on the tatami, the other floating in the air... It is only natural that some people have more flexible legs than others, but why pose for a picture that is supposed to explain to beginners how to sit in the full-lotus posture, if you can sit that way yourself? The way the chin is drawn back on the right isn't natural either. We are talking about human beings made of flesh and blood here, so it would be a mistake to expect an imperfect bodily creature to sit in a perfect posture in the first place. We all have our personal twists, or past injuries and other handicaps. So it is no wonder that we can not sit "according to the manual". 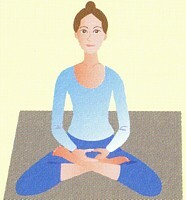 If we can not sit cross-legged at all, we have to find other ways to sit, like sitting on a chair for example. But there is a great difference between being aware of one's physical twists and still trying to do one's best, and sitting in a bad posture without even realizing that it is a bad posture. And this happens a lot, because you can not see your own posture and often fool yourself into thinking that you are sitting straight when you are not. And it is still something completely different to move and change the posture each time you feel some pain, in a desparate attempt to always feel relaxed and comfortable. This month I am talking about illustrations for beginners, and although no human model is perfect, we should try to look for better examples than some of the pictures we have seen above. If the picture contradicts the text, whom are we supposed to believe? A picture is usually easier to understand, so most people will end up copying a wrong picture and ignoring the text even if it is correct. I am afraid people will expect me to do more than just critze others, so I'll post two pictures of my legs crossed below. I hope they help to illustrate how the tips of the toes reach to the outer edge of the thighs and the knees form an equilateral triangle with the base of the spine.